Risk Modeling for Excel is a training course for applying operational risk modeling and statistics to business and data analysis in excel. The risk modeling course covers 20 hours of self paced training for professionals involved in risk management positions. 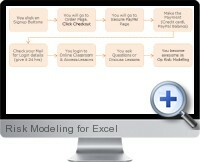 Training allows to download videos and example Excel workbooks from an online classroom environment. Operational risk modeling - introduction to risk analysis and concepts of probability distributions. Modeling the number and size of losses - frequency and severity distributions. Distribution fitting - parameter estimation, goodness of fit, aggregate loss modeling, aggregating variance across business streams and event types. Precaution analysis - employing EVT and GPD to avoid overestimation of capital requirements and confidence of parameter estimates. Data source evaluation - external data for operational variance estimation and combining capital estimates via internal data, external data and scenario analysis. Risk modeling software - open source risk modeling using R.